Microsoft has been a leader in the world of technology since its inception. The company has changed the way people work, lowered costs for small businesses and enterprise companies alike, and made computers more user friendly. This year, Microsoft is making three changes its own that could alter the tech landscape once again. The Microsoft Office suite of productivity products has been a mainstay of the company for decades now, but big changes are underway for 2019 and beyond. This year, Microsoft will officially launch Office 2019 – and businesses need to be ready. If you currently use Office 365, you’ll find the newest Microsoft offering quite familiar. Like Office 365, the new Office 2019 product includes staples like Excel, Word, Visio, Project, Outlook, PowerPoint and Publisher. And like the current version of Office, the upcoming Office 2019 is designed to harness the power of the cloud, making file storage easier and allowing employees to work from anywhere. The most distinguishing feature of Office 2019 is how it will be released. Unlike Office 365, which has experienced a series of changes since its initial release, Office 2019 has been designed as a one-time product. 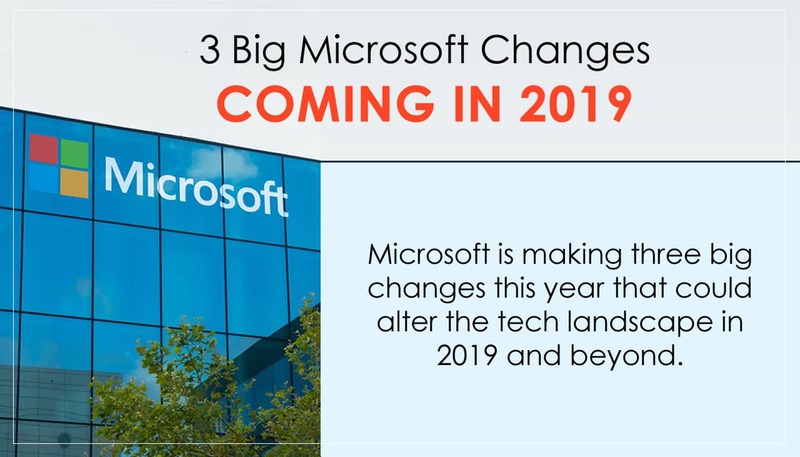 In 2019, businesses will need to decide if the move to Office 2019 is the best strategic decision for their company. If you’ve placed a video call to a colleague across the country, or a family member on the other side of the globe, you understand the power of Skype. Now, Microsoft is changing things again by replacing Skype for Business with Microsoft Teams. Microsoft Teams is the long-awaited replacement product for Skype for Business, and the new release includes a number of corporate-friendly features. On October 1, 2018, Microsoft officially announced that new customers with fewer than 500 seats would no longer receive Skype for Business as part of the Office 365 product line. In 2019, the replacement of Skype for Business with the new Microsoft Teams will finally be complete. Unlike Skype, Microsoft Teams has been designed from the ground up with business users in mind, incorporating a host of powerful features to make collaboration and file sharing easier. By harnessing the power of cloud computing, Microsoft Teams has designed a single platform that businesses should find very useful. The new Microsoft Teams product includes an easy to use chat app, as well as all the capabilities of Office 365 and Slack. Businesses looking for a reason to upgrade should find this combination quite compelling. Contact Ontech at 262-522-8560 for more information on available onsite user training for your company. While Microsoft has long been a leader in operating systems and server software, the company has not seen the same success with its browser products. Some older versions of Microsoft’s Internet Explorer browser were plagued by security issues and glitch performance, and the company saw a steady decline in market share as newcomers like Mozilla’s Firefox and Google’s Chrome came on the scene. The old Internet Explorer eventually gave way to a new browser dubbed Edge, but the new product suffered from many of the same issues. Now, Microsoft is rebuilding it using the same open-source software that powers Google Chrome and they’re even bringing it to Mac devices. The rise of open-source software has been a major story over the past couple of years, and the retooling of the Edge browser is just the latest example. While Microsoft Edge isn’t going away, if you already use the browser, you’ll notice that websites display more consistently after this under-the-hood change. For Chrome users, all of these changes also mean that the browser engine that powers Chrome will get better on Windows which is part of Microsoft’s continued effort to make the web a better place for everyone. As fast paced as technology is, we understand updates like these can feel cumbersome and at times confusing. Whether you have questions about Microsoft’s products or any other IT related issue, contact our support team online or call us at 262-522-8560. Ontech Systems is dedicated to the success of your business, and we are always here to help. As 2017 comes to a close, we’re sharing the 10 most popular tech tips from the Ontech Systems blog that generated the most interest and readership. These tips include everything from scary facts about smartphone addiction to what you need to know about OneNote for Business. 7 Scary Facts About Smartphone Addiction: Are YOU a Mobile Zombie? Is it better to Keep IT In-House or Outsource? 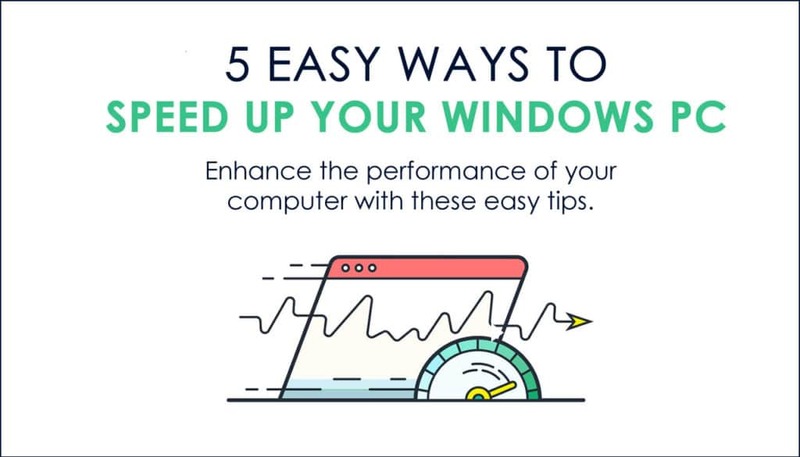 We know you’re busy this time of year, so let’s dive into each of the top 10 tech tips in ascending order. The “bring your own device” (BYOD) trend has significantly grown throughout recent years – and it’s no wonder. This blog post in particular likely gained traction due to shocking statistics like “businesses gain a whopping 240 extra hours of work per year when they implement BYOD in the workplace”. But there’s also a dark side when it comes to BYOD – 80% of BYOD is unmanaged, leaving most businesses wide open and vulnerable to cyber security attacks. Whether you’ve already integrated the bring your own device trend into your workplace or you’ve been on the fence, check out this popular post on BYOD statistics to understand the pros and cons of adopting BYOD into your workplace – and how to avoid putting your business at risk. If you’re a Microsoft user, you’re probably already familiar with OneNote. Maybe you’re even using it as your digital notebook. But the truth is, OneNote is so much more. There’s a lot of information floating around about OneNote, but it’s not easy to find everything in one place. That’s what we’ve done with this post on OneNote for business and it’s one of the reasons this article has spread like wildfire. We’ve covered what you need to know about OneNote from A to Z – collaborating on ideas with co-workers, project management with OneNote, security aspects, and a few interesting facts most people don’t know about this popular productivity tool. Get a new perspective on OneNote and take it to a whole new level. If your business still running Windows Server 2003, it’s critical to upgrade your server or move to the cloud today. With the introduction of Windows Server 2016, Microsoft will never again release an update or security patch for Windows Server 2003. This presents a massive opportunity for hackers to infiltrate your network. Security aside, Windows Server 2016 introduces a lot of great new features you’ll want to check out right here. Data backup and recovery is always a topic of discussion when we meet with businesses throughout Southeastern Wisconsin. We often find they have a false sense of security and assume that just because they have a backup method in place, they have their bases covered. But in reality, if you don’t regularly test your backup, it could fail…or worse – not back up your data at all. To spread awareness about the importance of this topic, we created this post as the first in a 5-part series about data backup and recovery. We kicked off the series with startling statistics to encourage businesses of all sizes to take this topic seriously and give their backup method another look. Out in the field, our techs see a lot of scary situations that could otherwise have been prevented with a solid data backup and recovery plan. Check out these startling statistics for yourself and don’t hope for the best – plan for the worst. While passwords are an annoyance to those that need to remember them, they can also be a major security risk to businesses. This blog post provides you with some easy tips to remember a secure password along with a few nifty tools so you never have to remember your passwords again! Kiss your password problems goodbye! 6) 7 Scary Facts About Smartphone Addiction: Are YOU a Mobile Zombie? Are you familiar with the term “nomophobia”? It’s a new term for smartphone addiction developed in Britain in 2008. Technically, nomophobia is the fear of being out of mobile phone contact. Those who fall under the umbrella of this addiction check their phone up to 900 times a day. Yes, smartphone addiction is very real. Check out these scary facts and see if you or someone you know suffers from nomophobia and see what’s really at risk. 7) Love ‘Em or Leave ‘Em: Is it Better to Keep IT In-House or Outsource? At some point in time, the number crunchers within your organization may have evaluated whether it makes sense to have in-house IT or outsource it. IT isn’t a one-size-fits-all solution, so many businesses often end up going with a hybrid model. 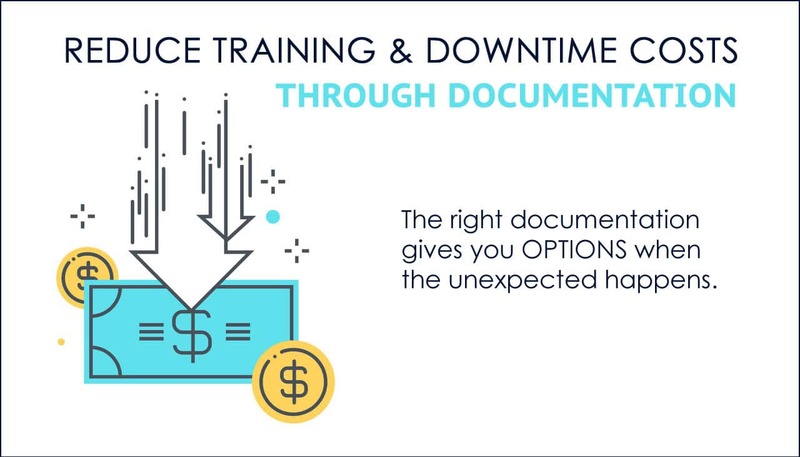 Get the low down on pros and cons of in-house vs. outsourced IT and make the informed decision that’s best for your business. There’s no getting around it – spam is synonymous with email. At some point in time, you might have wondered, why do they do it? Nobody really responds to spam anymore, right? Wrong. Phishing attempts have increasingly become more sophisticated, fooling even the most experienced computer users. If spam is still finding a way into your inbox, find out how to stop it and take these precautionary steps to prevent it from infiltrating your inbox in the future. Find out everything you need to know about OneDrive, all in one place. Digital clutter stresses us out on a daily basis. From photos, to emails, digital accounts, passwords, and business documents – it’s endless and overwhelming. While this post was written in the vein of Spring cleaning this past April, it’s since continued to gain traction and there’s no better time than the present to take control of your digital life. So what are you waiting for? Get rid of junk email, back up your Facebook data, organize your email, and deactivate old accounts with these helpful tips. Most of all, thank you for being one of our valued readers. We appreciate your interest and we hope you find these tips and the newsletter articles helpful. If there is a topic you would like us to cover in future newsletters, we want to hear it! Just contact our marketing team and let us know. What it is: If you’re new to mobile device management (MDM), chances are, you’ll hear more about this BYOD (bring your own device) trend in the coming year. Driven by an increasingly mobile-based infrastructure, the need for a solution to secure, monitor, manage and support mobile devices across a shared network was born. Why it’s trending: In short, MDM can help your business cut costs, increase employee productivity and maintain control over data while allowing employees to use personal devices in the workplace. Since employees can use their own devices, businesses save on equipment costs like PC’s, laptops and software updates. In terms of employee productivity, rather than feeling tied down to a desk, employees can work from anywhere and have access to important files – when and where they need them. What it is: Let’s face it, most businesses can’t say with 100% certainty that all employees stay on top of antivirus updates, critical software updates and keep their computers free from spyware. Desktop Monitoring is a managed service that quietly monitors and repairs common problems so employees can stay productive and avoid those annoying time-sucking computer problems. This unobtrusive solution monitors computers and immediately notifies IT staff when there are critical (or not so critical) issues. Antivirus is included – desktop monitoring does not slow down the computer. IT techs can easily remote into the workspace to save money on travel charges. If a virus infects a computer, techs take care of it before it infects your entire network. What it is: Otherwise known as an IT service desk, through this managed service, businesses receive immediate IT support when and where they need it, 24/7. Working late? Early? Weekends? Anytime you run into a technical problem, simply pick up the phone and you’ll be speaking with a seasoned technician with a minimum of two-years’ experience resolving application, desktop and network-level issues. From PC and network troubleshooting, virus and spyware removal, to file and folder restores, immediate assistance is just a phone call away. Why it’s trending: This service provides a cost effective solution to scheduling a formal service call with a tech. No problem is too small and each time a user calls the service desk, a technician automatically sees the unique customer profile so staff can quickly get into correcting the problems rather than being bogged down by answering questions to confirm their identity. It’s instant, hassle-free IT support when you need it most. What it is: Server Care makes it possible to prolong the life of a server by proactively performing preventative maintenance on a 24/7 basis. In addition to automatic monitoring, technicians personally monitor the server weekly. If they find anything of concern, the issue is immediately resolved. Antivirus is included for the server. 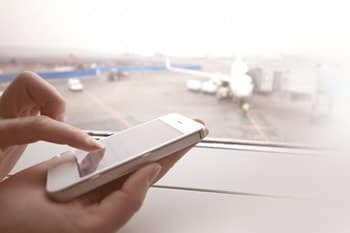 No need for travel charges – if a problem arises, a tech will fix the issue remotely and escalate the response as necessary. What it is: Business continuity is designed to quickly revive your business network and have employees productive again in almost no time. It automatically backs up important data as frequently as every 15 minutes. If there is a problem, files can be restored in about 30 minutes. Why it’s trending: If a small business can’t resume operations within 10 days following a natural disaster, it probably won’t survive. Rather than risking losing billing and inventory records, customer lists, and other vital data, organizations are turning to business continuity solutions to get back to business – fast! 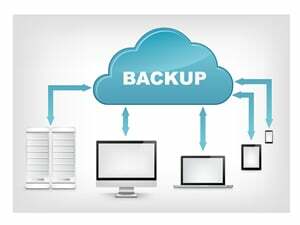 Businesses required to comply with data backup HIPAA are increasingly relying on business continuity to keep them in compliance with HIPAA’s rigid data backup and retrieval standards. How Can These Services Help Your Business Thrive? Have questions on any of the services above? Ontech Systems can implement any of these services into your business with minimal disruption to your daily workflow. Contact us to learn more. To get expert recommendations and have one of our highly qualified techs evaluate your network, request a free network discovery where we answer all your technical questions and concerns. There is absolutely NO cost, NO obligation and NO commitment required. Considering managed services vs. in-house IT management? Get the pros and cons here. For technology questions or any other inquiry, please contact our office by email or by phone at (262) 522-8560. Update #1) Thinking of upgrading to Windows 10? Contact us for our recommendation on the best time to update. What’s new in Windows 10? Get the full story here. Microsoft released Office 2016 for Windows on September 22nd, offering a number of small but notable updates to the productivity suite. Check out some of the highlights here. If you are still running SQL Server 2005 after April 12, 2016, you will no longer receive security updates. Now is the time to upgrade to SQL Server 2014 and Azure SQL Database to achieve breakthrough performance, maintain security and compliance, optimize your data platform infrastructure and avoid the risks of running unsupported software. To plan your plan your SQL Server 2005 migration, please contact our office by email or by phone at (262) 522-8560.